The British Astronomical Society has joined with the Campaign to Protect Rural England for Star Count 2019. This cosmic census that will help map light pollution across the country. All you will need to do is to count the number of stars you can see (with the naked eye) within the constellation of Orion. The national Star Count will take place from Saturday 2 February until Saturday 23 February, to give families a chance to take part. Try to do your count on a night when the sky is clear, with no haze or clouds, then wait until after 7pm so the sky is really dark. Looking south into the night sky, find the Orion constellation, with its four corners – and ‘three-star belt’. Take a few moments to let your eyes adjust, then simply count the number of stars you can see within the rectangle made by the four corner stars – Betelgeuse, Bellatrix, Rigel and Saiph. You should not count these corners stars, but you can count the three stars in the middle (the belt). Make a note of the number of stars seen with the naked eye (not with telescopes or binoculars) and then simply complete the online survey form on the CPRE website (will be available at the start of the Star Count). Check back to see the national results and see how your area compares to the rest of the country. 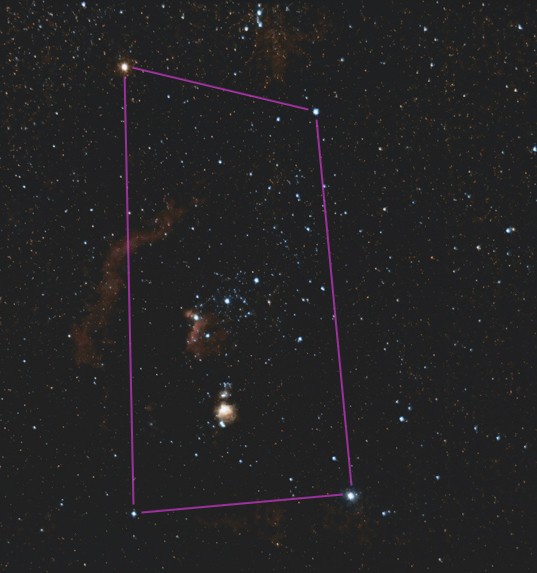 The constellation of Orion showing the Star Count area. Count stars within the area marked, but not the corner stars.